... "I've got a new story from Jack Vance that I love. It's called The Dragon Masters, and it's about a race of dragon-like creatures from a distant planet who are at war with the human race. The dragons have captured some humans and the humans have captured some dragons and they both have genetically modified their captives to fight for them. Altogether there are around a dozen modified races, and I want a portrait of each, plus anything else you want to draw. I think Hugos will rain for this, so come get the ms."
I'm an avid reader of Pohl's blog. I recently read All the Lives He Led, his 2011 novel, and would like to say good things -- but it was a mess. 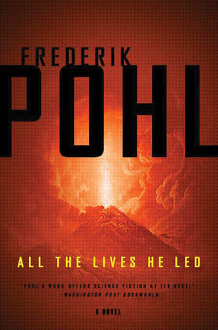 There's some fun in Pohl describing a world so nihilistic in 2079 that acts of terrorism are committed daily by ridiculously silly groups, but his main character is a passive dolt who makes a series of dumb decisions. At one point, after he's escaped police forces under a cloud of suspicion and smuggled himself by airship from Pompei, Italy, to Egypt, over the course of several chapters, he just turns himself back in. The protagonist's so inconsequential to the events of the novel that the last third consists of him watching video of what other people did and telling you what he sees.